"Let's be nothing; I heard it lasts forever." They spoke of days before. Of joy and nostalgia and sadness. Of how the hills were covered in grass, and how the sky shone with a radiant blue. How birds sang and buildings towered high into the sky, rippled in shiny metallic glory. Now everything is grey. A desolate landscape where there is no life. Where dust is carried through the wind, as sharp as needle-prick knives. And one step outside tears you to shreds. Ribbons. If you don't die from that, you'll die from heat exhaustion. The outside world is all they talk about, and they don't realize I have been listening. I latch on to every word formed by their hoarse voices. The only time they acknowledge my presence is to tell me never to go outside. Never. It's for my own protection, they say. But they have forgotten to tell me what would happen if I had no choice. This story line is completely my own. Chapters are usually 1000 - 2000 words. All the earth is torn asunder. There used to be grass, and the sun used to be golden. Children played outside, climbing trees with smiles on their faces and grass stains on their knees. People worried about a million things that would soon be irrelevant, continuing without a clue of the disaster to come. Centuries later, what little is left of humanity survives in a society constructed beneath the surface of a glass dome, the world outside converted to little more than a desert wasteland. Survival is a routine rather than an effort, and all rules are surpassed by only one: if you want to survive, you never leave the dome. There's nothing alive out there. The radiation that soaks the earth makes sure of that. Until one day, someone finds a bloody, dust-covered handprint on the outside of the glass. 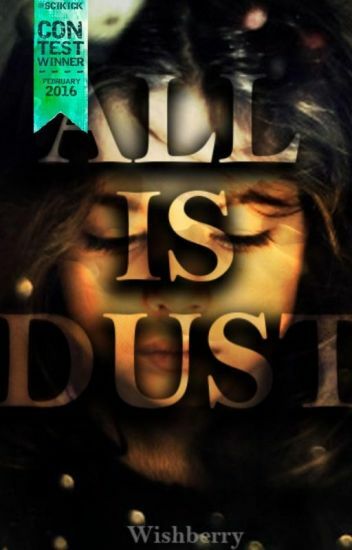 Book 2 in the Burning Series: the sequel to Dust. There used to be men, and there used to be monsters. The line between the two is blurred now. Long ago, the earth spun in a constant cycle. There was life. There was hope. It is no longer such. Humanity cowers beneath glass domes in the midst of the desert, afraid of radiation that no longer pollutes the air. But there are darker things hiding in the wilderness now. Wild things. Cursed things. Burning things. Yet, not all is lost. Ashes, ashes. We all fall down sometimes. But what happens when you can't stand again? T H E explosions are deadly. That's what they'd been saying about the bombs that started exploding one February afternoon. Now radiation cloaks the earth like a new empire. V E R Y  dangerous heists are at hand. One serious betrayal to America and the entire world blows up if one wrong move is made. T H O U S A N D S are dying by the second. Those are the records they told us on the news before the power went out. From bombs and radiation itself, places are being torn apart--the entire world is being ripped by a single protest...at least, that's what they want us to think. Rebels spill into malls and invade homes. T H E R E 'S only one place to hide. There's only one place that's safe; Washington D.C, where the tunnels and shelters are. People rush to the borders of their states, dashing to get to D.C before the end of the world collapses and we all die. My family got taken to D.C. My sister and I got left behind. The Rebels call survivors of the bombs R A D I A T I O N  C H I L D R E N.
I call us lucky as hell. Centuries after the Fall, the United States has been wiped away. The crumbling remains of the great American empire are home now only to savage, lawless tribes and packs of ravening Damned-the twisted children of the apocalypse. Most of those few who survived humanity's destruction spend their short lives in a violent struggle for survival. But some light still flickers in the darkness: the Blessed of Bountiful live in seclusion, relying on walls both physical and spiritual to protect them from the Desolation that their world has become. Among them are the Saints, those few men and women born with superhuman abilities that the Blessed see as gifts from God. The violent apostate tribes of the Northeast Kingdom have always been a danger, but up until recently its small size and the vigilance of its people have made Bountiful an unappealing target. As attacks on the community grow harsher and more frequent, however, even the steadfast Blessed are forced to start preparing for the worst. Exile was a semi-finalist in Mark Lawrence's Great Self-Published Fantasy Blog-Off (#SPFBO). Fantasy Faction said it was "extremely cool," and Bookish Lifestyle called it "more than just a story, a journey and an experience." When I'm asked about it, I often describe it as "X-Men meets The Walking Dead." In addition to reading it here for free, you can buy Exile in e-book or paperback on Amazon.com. Everyone in the After knows there's a curfew. It's an unspoken, unofficial rule that everyone follows. From eight at night until eight in the morning you had to be inside a secure shelter. Well, technically you didn't have to...but if you didn't you would either get killed, eaten, or dismembered to the point where you died before anyone found you. What killed you if you were out after curfew? Why, the Beasties of course. The After is after the bombing of the whole Earth. Only a few hundred survived, currently scattered throughout the world. Stella Thorn is one of those few. She lives in a Rubble City in what was known as California in the Before. She is finally starting to survive just fine, getting used to her way of life, creating a schedule, when a Wanderer comes to town. Will he change her life forever? Does he have secrets about the Bombing that no one could ever imagine? When Maya and Grace wake up for work it's a normal day. They didn't expect it to be any different than a usual work day. Boy were they wrong. On arriving at work they find a bloody mess and begin realizing that people are turning into unstable killing machines. Their friend Jon rescues them before they are hurt but they are all horrified as an epidemic unfolds within the perimeter of the campus. How will they survive and what will happen to them and the people they love if anyone can be turned into a mindless killing machine? How will they escape? Who will lead them in these rising times of peril? What will they face, who will they lose, and how will they keep each other alive? And by alive, they mean alive and themselves. Not moving and killing. Follow along as this rag tag group of teens survive an apocalyptic world that gets worse by the moment. For any who started "Presences",  I decided to combine it with "When August Ends" instead of doing two separate books so it is now a part of this single novel. "It's ok to show that your upset, Jillian. Deep down we're all suffering, just that some people show it more than others." Aavet tells me.